There are several ways that people could break their phones. They range from simple accidents to outrageous freak accidents that make history. Some of these accidents that can break your Android device happen more than others. Let's look at the top three most popular ways to break your phone. We all know this one; almost everyone has broken a phone in this way. It is estimated that 30% of all broken phones happen because of simply dropping the phone. What is surprising however is that sometimes people drop phones when they try to toss the phone to a friend across the room. Water is another way that phones get destroyed. A lot of times, your phone can fall in the bath or toilet. With water however, there is the slight chance that you could save your phone if you dry it out fast enough. Water is responsible for 18% of all broken phones. There are several other unusual ways to break your phone and they all fall in the other category. They include things like sink-hole, your phone falling from roller coaster rides. Believe it or not, they happen a lot more often that you think. 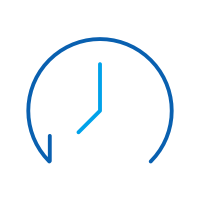 When one of these situations happens, the worst thing is not the phone is broken, but we are unable to access the precious data, such as contacts, text messages and more that have been stored in the phone memory, any more. Fortunately, now we have dr.fone - Recover which can help us to recover SMS messages from broken Android phones. Let's see how it works. Before doing anything else, have a look at the primary window of dr.fone. Firstly, install and run the program on your computer, connect your broken Android device to the computer with a USB cable. After that, select "Recover", and then goes to Recover from broken phone. Then choose the file type "Messaging" to recover text messages from broken Android phone. 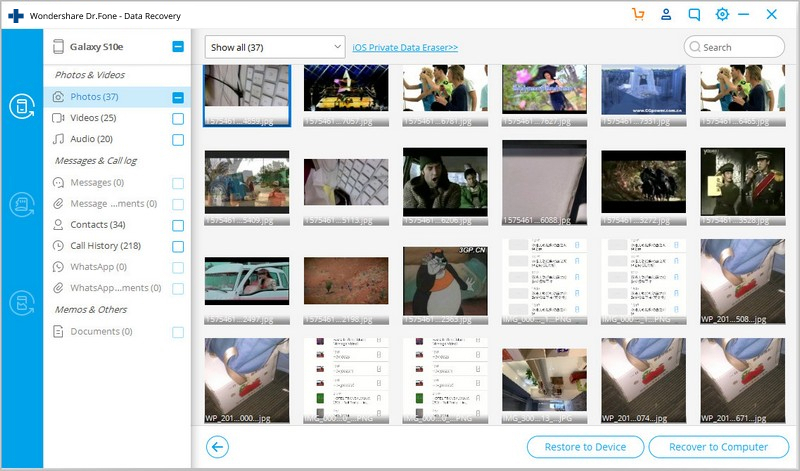 Obviously, dr.fone - Recover can also support to recover other data types, such as Contacts, Call history, WhatsApp messages & attachments, Gallery, Audio and more. 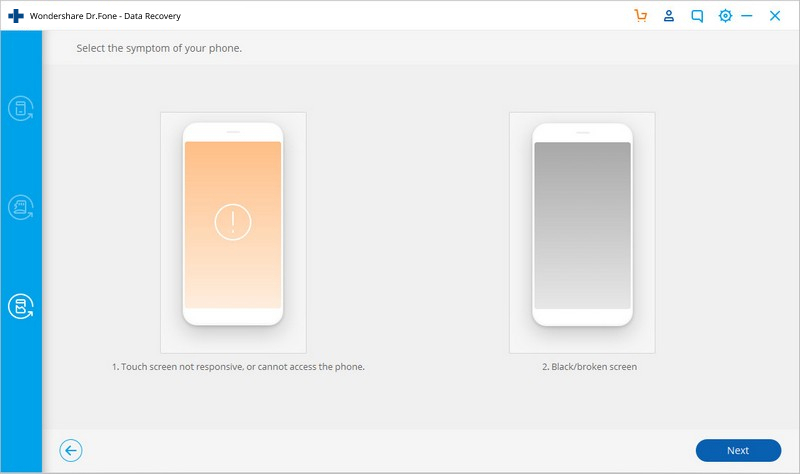 In the below window, one is "Touch doesn't work or cannot access the phone" and the other is "Black/broken screen". Select the second one since we'd like to recover text messages from broken Android. Then it will lead you to the next step. 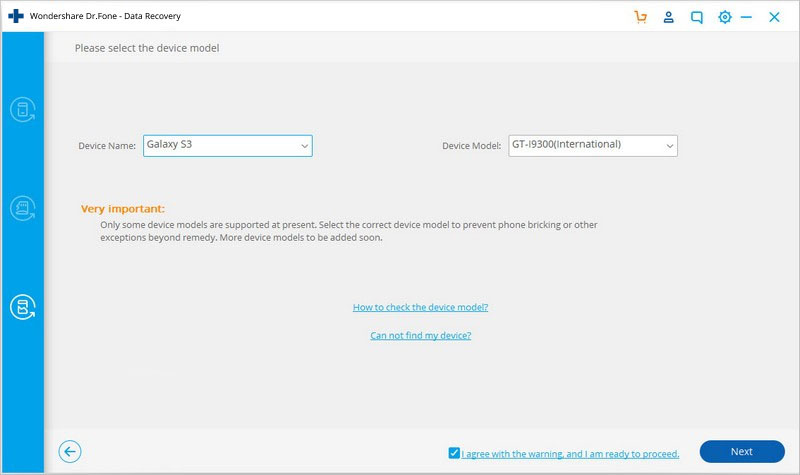 Then, select the correct Device Name and Device Model for your broken Android phone. What you need to do after the data analysis is to scan your broken Android device to find the deleted messages. First, you need to click the "Allow" button appearing on the screen of your broken Android after the data analysis. When the "Allow" button disappears, click the "Start" button on the program's window to let it scan your broken Android. 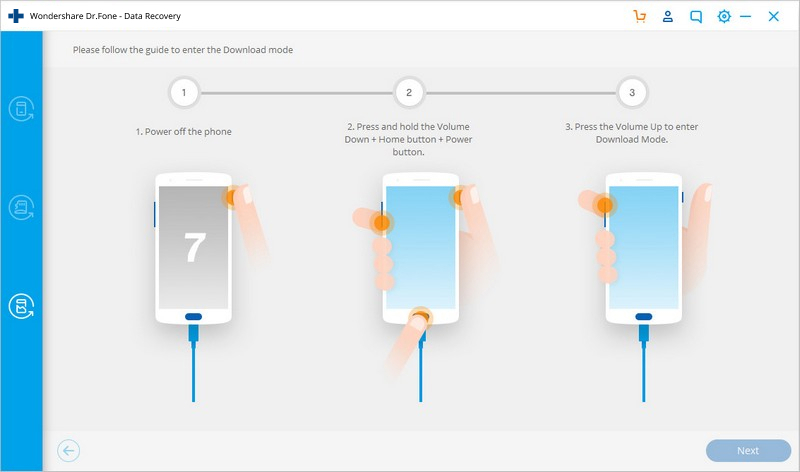 Now, you can follow the instructions on the below window to get your Android phone into the Download Mode. • Power off the phone. • Press and hold Volume "-", "Home" and "Power" button on the phone. • Press "Volume +" button to enter download mode. Then dr.fone analyze your Android device automatically. The analysis and scan process will cost you some time. When deleted and undeleted messages have been scanned, it will present you a note. Then you can begin to preview and check those messages in detail. 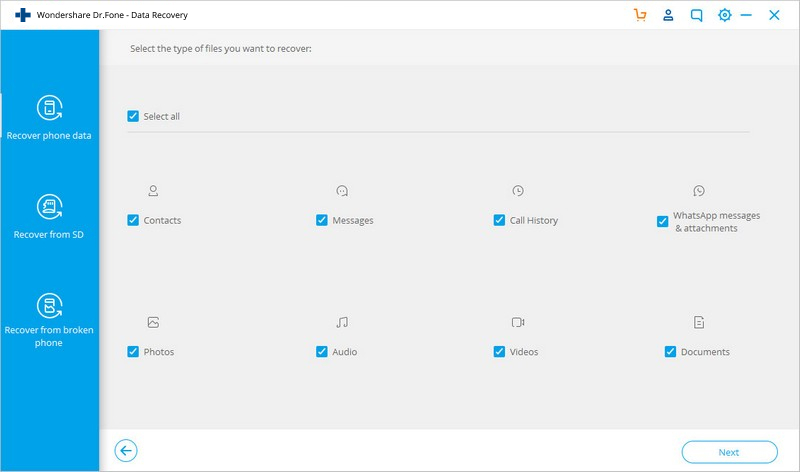 Choose those you want and click "Recover" to save them on your computer with one click. 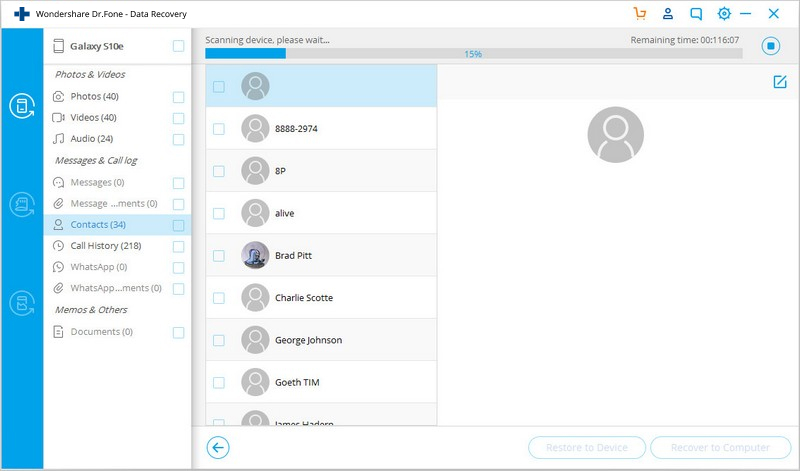 Moreover, you also can preview and recover contacts, photos and video (no preview) here, and recover them to your computer if you have a need. 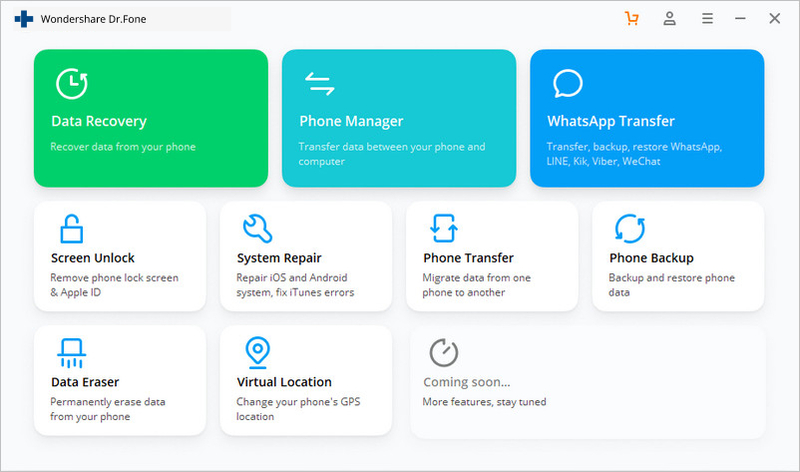 As to the messages and contacts, they're not only those recently deleted from your device, but also those currently existing on your broken Android device. You can use the button on the top: Only display deleted items, to separate them. Of course, you can distinguish them by colors. Congratulations! You have recovered SMS messages from your broken Android phone, and they have been saved in your computer. • Take good care of your phone and remember to back up your data as often as possible. • Erase your private data on you broken phone if you don't want to use it anymore. 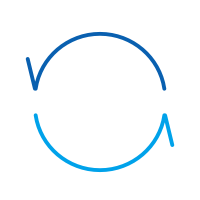 SafeEraser can permanently erase your Android & iPhone and protect your private information when selling, recycling or donating your old device. A broken phone can cause great deal of stress to the user, it therefore helps to have a few tricks up your sleeve to help you fix your broken phone. The following tips can come in handy for you when you try to fix a broken Android device. It is very important that you fix be very careful when fixing your broken home screen. The following tips should help you do this easily. • Before you transfer a new panel, you will need to transfer the Home button. • Once the home button has been transferred, you are now ready to install the new front screen display. Start by reconnecting the cables at the top panel and then reconnecting the Home Button. Finally pres the new screen on and secure it using the two screws. Power up the phone to ensure that everything is working the way it should be. The rear panel of your phone is just as important and here's how you can replace a broken one. • Ensuring your phone is turned off, the first step is to remove the defective back panel. If there are screws use a small tool such as a screw driver to remove it. • Replace the defective rear panel with a new one being extra careful if your device has a rear camera. The last thing you want is to damage the camera lens. To replace the home button, take the following tips into consideration. • Once it is free, you can easily replace it just be sure to be very careful. Of course if all of these steps seem too technical for you, the next best thing would be to call a phone repair technician. Most of them can do these repair services very easily and quickly. Here are a few simple steps on how to back up your text messages and notes on iTunes. Everything on your phone is really a distraction, be it your navigation, music player, having a conversation or texting. Here is a list of the top most text messages encrypting apps with details.